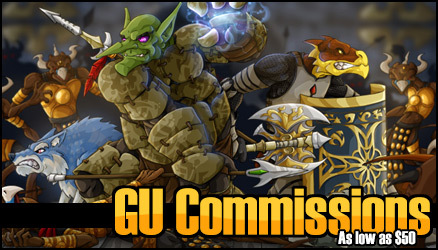 GU PSA: "A Very Special GU"
I'm loathe to ban people from the forums. So a while back I set up a new group on GU called "Moderated Members". This group is reserved for people who consistently fail in their attempts to communicate in a meaningful way with this community. But, on the off chance that they'll change their posting style or say something that really progresses a thread, I want them to be able to post. Their comments just won't show up until I read and manually approve them. As of early yesterday there were only 5 Moderated Members. Then someone who had been a part of the group previously -but earned their way out- relapsed, making a baseless comment that was better suited to being a Private Message. This comment served no purpose other than to be a negative jab aimed at another user. So Fwoop! back on to the list they went... permanently. Now since I tend to draft my life into the comics, I decided to deliver a very special GU. Sure it took me longer to post, but hey! look at the size of that thing. 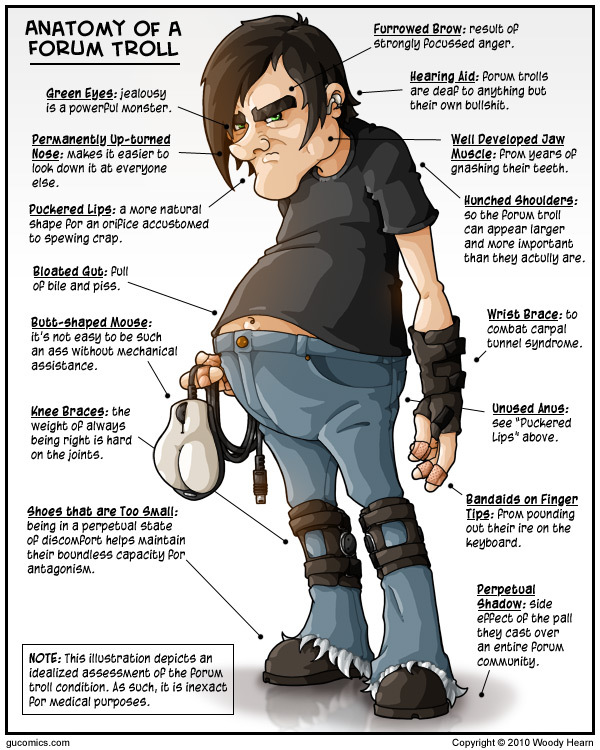 "Emo Hair: all forum trolls have emo hair. No reason has been discerned; that is just the way it is." "Vampires Don't Sparkle T-Shirt: even forum troll's refuse to accept that crap." There was also a "Critical Analysis" that surmised the cause of a forum troll's endless quest for attention to be parental neglect during their formative years. "Diagnosis: Needs a hug." It just felt out of place as this was supposed to be an anatomy chart not a medical assessment. Anywho, I hope you guys get a kick out of it. Comics will return to regular size Monday.